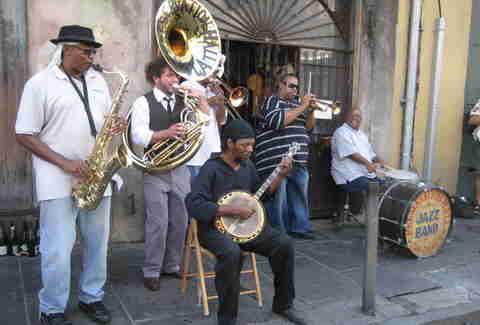 If you’re even thinking of being in New Orleans, check out the rest of our DestiNATION: New Orleans guide. It’s stacked with expert advice from locals on what to eat, where to drink, and what to do. 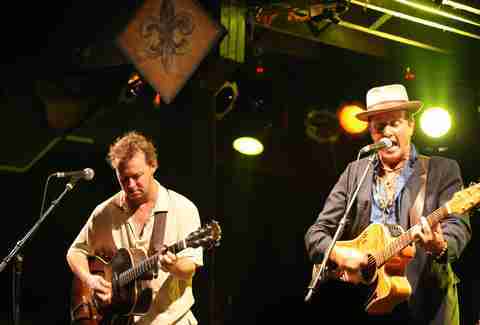 I 'm not sure, but I'm almost positive, that all music comes from New Orleans." So goes the much-quoted line from Ernie K-Doe, the flamboyant 1960s R&B hitmaker who reinvented himself in the '90s as the self-proclaimed Emperor of the Universe. Does it? The historians can apply themselves to the question, but meanwhile, visitors and residents alike find themselves offered an embarrassment of musical riches, both day and night, in this town: You'll mingle with brass-band street parades and dance sweaty-haired to post-midnight funk jams and sway to hot touring acts performing in glimmering fin de siecle amusement palaces. There's no closing time in New Orleans, the city that probably invented American nightlife -- so head out into that swampy, sultry, electric night, and see where it takes you. The ornate walls of One Eyed Jacks' 300-odd-capacity showroom are edged with scarlet sparkle-vinyl banquettes and hung with mid-20th-century pinup nudes painted on black velvet -- a louche, swank atmosphere appropriate to its history as an old French Quarter movie house and reputed speakeasy, the latter of which apparently left the club with a pair of ghosts. A slightly raked floor means there's not a bad sightline in the room, which is the premier downtown New Orleans destination for touring indie acts, hip local bands, and DJ nights, like the long-running and beloved Thursday night "Fast Times" '80s dance party. College kids mix with old punks and visitors, too, who are lucky enough to wander into the coolest spot in the touristy Quarter. Just off the streetcar line in the mostly residential Mid-City neighborhood, Chickie Wah Wah -- named for the tune by '60s rhythm and blues icons Huey "Piano" Smith and the Clowns -- is more than anything else a temple to the song. It's far from pretentious: The laid-back barroom festooned with vintage signs will keep you plied with Louisiana craft brews. But staff pays painstaking attention to sound, which makes it the best spot in town to hear local and touring singer-songwriters, folkies, and Americana artists. 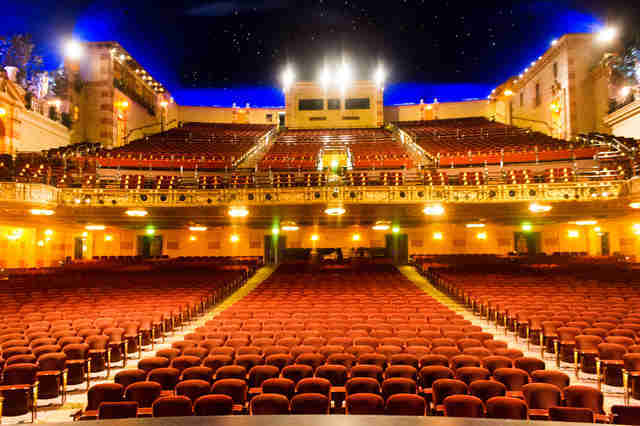 The Saenger began its life in 1927 as a grand movie palace decorated in the mode of a 15th-century Florentine garden, a gilded Rococo pleasure dome of opulent splendor. A decade-long renovation, after Hurricane Katrina damaged the 2,500-capacity theater, restored it to its original grandeur and beyond, from the custom gold-and-crimson carpet to the Greek statuary and twining vines in the balcony "constellations" that twinkle in its arched, midnight-blue ceiling. These days, the space hosts touring Broadway productions and big-name comedians like Jerry Seinfeld and Amy Schumer, but mostly concert performances from a diverse roster that has recently included Morrissey, Beck, Sturgill Simpson, and Alice Cooper. This windowless joint on busy, industrial St. Claude Avenue started out as an appropriately dark home base for New Orleans’ storied punk and metal scene, plus notable touring acts from that genre. The booking has since expanded to include regular gigs from gay bounce rappers Katey Red and Big Freedia, touring veterans Hawkwind and Walter Lure, psychedelic rock, goth DJs, comedy, and burlesque, plus free happy hour shows for local singer-songwriters and old-timey string bands. The cash-only window in the rear, between the jukebox and the pool table, dishes out killer Polish and Ukrainian food: pillowy pierogies, kielbasa, cabbage rolls, and a hearty vegetarian Reuben made with beets. Once your eyes adjust to the dimness, see if you can spot all the taxidermy. There's probably a turkey, frozen forever in flight, right above your head. The weathered wooden walls of Preservation Hall's narrow showroom still look the same as they did more than 50 years ago, when a group of bohemian fans started hosting pass-the-hat traditional jazz concerts there featuring artists who were at least as old as the music itself. Lines start forming just after sunset for the Preservation Hall Jazz Band, or one of its associated acts, to play nightly sets at 8, 9, and 10pm. 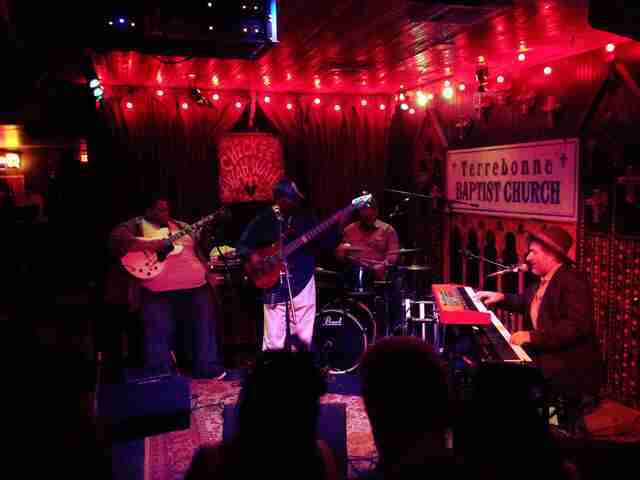 In recent years, particularly during big local events like Jazz Fest, the Hall has expanded its purview to present late-night collaborations between the regular Hall band and featured special guests, who have included the Alabama Shakes, Robert Plant, Sharon Jones, and even old-school bounce rapper DJ Jubilee. 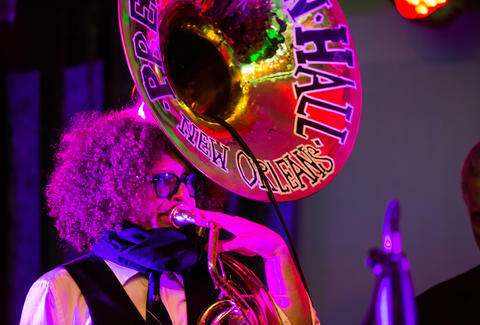 The Treme neighborhood is a historic incubator for New Orleans' many homegrown party sounds -- funk, brass-band music, R&B -- and the laid-back Bullet's rests in the heart of it. 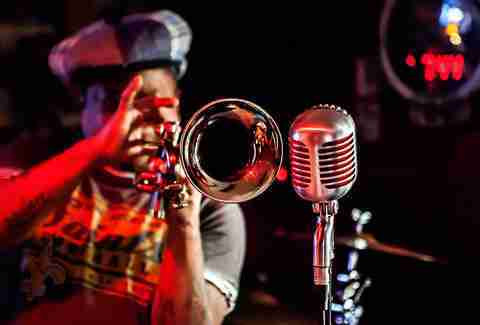 Acts like the raucous, all-female Original Pinettes Brass Band and enthusiastically weed-friendly trumpeter Kermit Ruffins play regular weekly gigs at Bullet's, which usually start fairly early (between 6 and 9pm) and attract a relaxed crowd of grown folks. Food trucks park outside during gigs, and drink specials are kind to the wallet. Founded in 1989, Rock 'n' Bowl moved a few blocks down Carrollton Avenue from its original location after Katrina flooded it. The new spot, boasting expanded outdoor seating and more dining options, still feels burnished by generations of New Orleanians' fun. 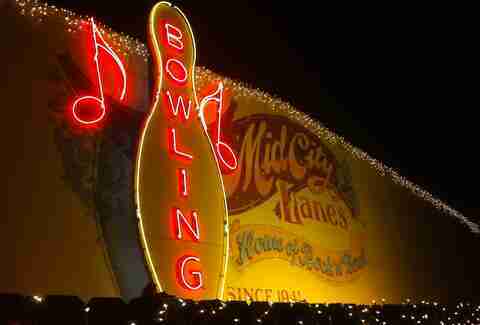 It opens at lunchtime -- because it's a bowling alley -- and live music, adjacent to the lanes, starts around 8pm. The bill is dancer-friendly, with lots of rockabilly, swing, and zydeco to draw folks onto the floor. That's for plain ol' guests, though; owner John Blancher, a bona fide local character, likes to climb up on the bar and boogie down at least once an evening. You'll see families hitting the lanes while dancers of all ages make the dance floor their own -- look for acrobatic young jitterbuggers swinging beside mature couples who remember when those partner dances were new. In the first month of 1977 a group of young New Orleans music fans -- history knows them as the Fabulous Fourteen -- pooled their money to open an uptown nightclub that could provide a regular gig for the aging rhythm and blues pianist Professor Longhair. Today, Fess' visage looms over the stage, above its famous peeled-banana logo; there's also a bronze bust of the piano professor just inside the door, and a statue of him outside. 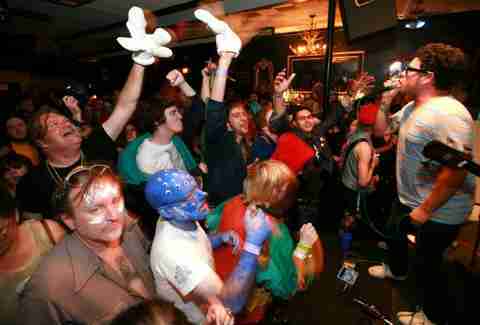 Tip's is famous for its long funk and jazz jams during Mardi Gras and Jazz Fest, which start after midnight and usually end with face-melted fans lurching around on Napoleon Ave at sunrise. It also features its own Walk of Fame, where the bulb-lit bronze stars embedded in the sidewalk honor inductees including Dr. John, James Booker, and Mardi Gras Indian Big Chief Bo Dollis. Alison Parker is a writer and radio DJ in New Orleans.